With the deadline for Saddam Hussein to leave Iraq having passed Wednesday night, and the start of the bombing of the country citizens throughout the area will have a chance this weekend to show their support for the troops, no matter if they support President Bush’s decision to attack or not. Walter Haan, publisher of Middletown-based Southfarm Press and military history Web site war-books.com, is urging support of the troops in a unique way from veterans of the armed services. Following the Sept. 11, 2001 terrorist attacks, he encouraged veterans to show their support of current soldiers, sailors and airmen by wearing their original dog tags outside their shirts. Haan continues to encourage the veterans’ support of the troops in the Middle East in the same manner. "There’s only really one way veterans can show their support; it’s visually wearing their dog tags," Haan said. Normally dog tags are meant to be worn underneath clothing. "I feel it’s better dog tags be outside to show support of the men going into action." Haan is a U.S Army veteran, serving during the Vietnam era. He also served in the Peace Corps during the 1960s prior to his military service. "I definitely feel we should be supporting our troops to the best of our ability. It’s important," Haan said. He added it does not matter whether a person supports a war, but the troops should be supported. "Whether you believe in the president’s (decision) or not, these men are ready to give up their lives." When Haan got out of the Army in 1966, as he was walking down an aisle at Grand Central Station, a gentleman in a suit asked him how many babies he killed, he said. "This is not the way the servicemen should be treated," Haan said, adding that was what was wrong with Vietnam. "These men (during Vietnam) didn’t have the respect of the country and were mistreated as they came back." I opposed the invasion of Vietnam as vigorously as I now oppose the invasion of Iraq. I always had, and now have, the deepest respect for our service men and women. I had no respect whatsoever for the blatant lies told to get those service men and women in harm's way. They deserve better than that! 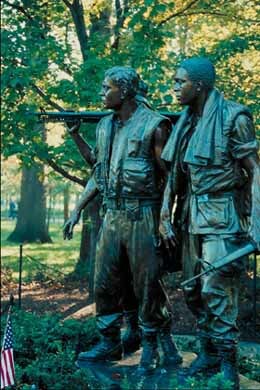 When the veterans returned from Vietnam, I helped place them in civilian jobs through the Veterans' Readjustment Act. I would hope we would have a similar program this time. In the meantime, I feel I can support them and their families best by getting them back home NOW! I will continue to work toward that end. Please join me! Our troops are in harm's way to overthrow a tyrant who has put our entire country and way of life in harm's way. Our armed forces are the best trained and most lethal on the face of the earth. Let them finish the job and then come home. I just want to remind everyone that the use of the word "men" to characterize our troops is no longer accurate and makes invisible the contribution and suffering of women currently serving (and not just in cushy desk jobs.) Indeed, some now are held as POWs. As to whether or not the political purpose as defined by the current administration is one worth the sacrifice of our military personnel is not so cut and dry as some would have us believe. There are many tyrants in the world, some of whom our government calls friends. If our gov't was truly all about ridding the world of tyrants, why do we spend so much money supporting and arming so many of them? Indeed our gov't once called Mr Hussein a friend and they were quite happy, when it suited US political aims, to provide him with arms and even components of these weapons of mass destruction we are now so indignant about. The CIA even provided him with coordinates to use these weapons against those we then called enemy. On the other hand, there are those who accept and support the theory of US hegemony. Some members of this current adminsistration (Perle, Wolfowitz, etc. )are at least willing to call a spade a spade. I am willing to support our troops but I am not willing to support the lie that we are fighting for some humanitarian motive in order to make the suffering of our troops more glorious. The peace movement has not put our soldiers in harm's way for less than noble reasons. The administration bears the full weight of that responsibility. It's Mr Bush who needs a lecture about supporting our troops. While he gets out there on the airwaves giving emotional and propagandistic speeches about our brave young troops, his administration quietly proposes reducing veterans' benefits. It took the US gov't years to acknowledge illnesses of vets from the last Gulf War, rendering them ineligible for benefits during that time. Veteran hospitals are so underfunded that substandard care has become commnon place and that is assuming the vet is not turned away at the door as my father was. Again, just who needs to be reminded to support our troops? If our gov't didn't see fit to use military force to solve problems it created at an earlier time, we wouldn't even be having this conversation. I find it hypocritical for war protesters to say they support US troops. This is like vegetarians saying they support cattle ranchers, or death-penalty opponents proclaiming support for the executioners. Let's call a spade a spade. US troops have no business in Iraq and those of us against this imperialist war should speak out against it...and against the US troops involved. Regardless of how you feel about the war, remember that our service personnel are there because they are obligated to respond to orders received from the President, their Commander-in-Chief. Our military is not a political institution, so no debate over the merits of the conflict are permitted. Their role and mission is clear. If we have problems with the war, it is our elected representatives we should be addressing. The Congress gave the President the authorization to conduct this war and place our troops in battle. We are not obligated to support them, they can be recalled (voted out of office), but our troops deserve our support. Before I was a Peace Corps Volunteer I was an enlisted man in the US Army, serving in Korea. I have a son who is a Marine Corps Captain fighting in Iraq. He was at the Pentagon on 9/11 and was decorated for helping in the rescue and recovery efforts that day. When the President ordered our forces into battle, he went because he felt an obligation to his nation, the Marine Corps and his other comrade-in-arms. While I have serious issues with this war, I’m still proud of my son and will support our troops, even as I continue my efforts to see this war comes to a swift conclusion. I am flying an American flag day and night at my front door in support of our service people who are risking their lives due to an insane administration. I support the soliders, sailors, marines and flyers but not their Commander In Chief! I support the troops by protesting the Irag invasion in the hopes of bringing the soldiers home from this insane imperialist adventure. This invasion is completely wrong and will only lead to worldwide hatred of us. Ellegant, above, is absolutely right when he says the Bushmen "have upset decades of good work by Peace Corps throughout the world." I was an army brat before I was a PCV and I thank Ed Willett for so intelligently expressing the perspective I have. I pray for the safety of our soldiers and will work to bring them home as quickly as possible. I do not support a US Occupation of Iraq. The United States Military has put more Americans to fight in Iraq in twelve days than the United States Peace Corps put in the Third World, in forty two years, to help. Here's a thought: What kind of world would we have today if the military and the peace corps have offered Americans, who volunteered to serve their country, the exact same opportunity and benefits? What if poor kids could have gotten a GI Bill through the peace corps? I think we would had a very small well trained military and a very large peace corps. Most importantly, we would have had a huge RPCV community- all of whom had called another country home for a while and other people, friends. I don't think we would be at war. I think we would be safer. I think peace is the best defense. I'm a dual veteran and I've always supported our troops, so many are still in their teens. They are trained to carry out orders. Some things are done and said in their name that are phony which I tolerate because it helps their morale. I am more worried what happens after the war. Will U.S. soldiers stationed in Muslim countries be sitting ducks for assasination? How will this war impact the security of PCVs and the viability of the Peace Corps itself? Will the doctrine of preemptive war minimize the coalitions with the United States more and more? Will the latter force the United States to pay off an increasing list of "allies" such as Turkey? My biggest fear is that the United States will get sucked into a holy war. I support our troops but this does not answer any of my growing list of my questions. I wrote this for a mother to use to send overseas. I know how hard it is to find just the right card. I was asked to write it by someone that saw one of my postings on a poem site. Do you know if there is a site I can go on to share it with others. Also in my prayers as I sit by the Christmas tree. Memories of wonderful times I have shared with you. For my heart has felt a void since you went away. To keep you safe in all that you do. Some of my thoughts have become so frightening. In my thoughts and prayers every day. And pray for the day you come home safe to me. ”I love you,” more than words can say. We are two hearts together in all that we do. God gave me my greatest gift when he gave me you. It is February, nearly a year since the US invasion and occupation of Iraq began. Many people will be attending vigils on February 15th to call for peace. If you do not know of a vigil in your area why not start one? You can look on this web site for ideas about how to organize. There is no theme, no main idea. This is for all who care about ending the war and bringing the troops home.